Geosites are sites of scientific interest based on geology or geomorphology that can serve various purposes such as research, conservation, education, tourism, and sustainable development. Quantifying their value to potential visitors and researchers is widely recognized as a useful tool for the effective development and management and for the protection of geological heritage of a certain area. Although many quantitative evaluation schemes have been proposed for various types of sites in Europe, over the past two decades, the schemes can give widely variable results for the same sites due to differences in needs and expectations, which can present difficulties for inter-site comparison for management purposes. It therefore remains necessary to develop a uniform evaluation scheme with low overall complexity to assist with prioritization and management. This study presents a new evaluation scheme based on the most commonly used attributes for quantifying geosites as applied to geomorphological landscapes and geological processes with natural and/or cultural heritage. The utility of the evaluation scheme is demonstrated through application to selected geosites in Japan, Germany, and Poland. 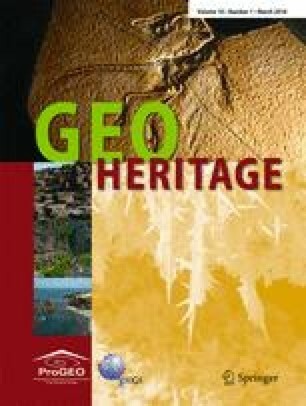 The results clearly show the present condition of geosites, identify their promotional advantages and disadvantages, and provide a widely applicable reference for planning and development of such sites for geotourism. The authors express their sincere thanks to Mr. Jacek Koźma of the Committee of the Muskau Arch Global Geopark for the support and materials included in this work. Thanks are also due to the many graduate students at Waseda University who supported this research in 2015. This research was supported in part by funding from the Institute of Advanced Studies in Education, Waseda University, 2015.